UPPSC Upper Subordinate Result 2016 Declared - uppsc.up.nic.in - check UP Upper PCS results Merit list Cut off marks. UPPSC had declared the qualified candidates list for PCS Main exam as per the order of Allahabad High court. Uttar Pradesh Public Services Commission (UPPSC) had successfully conducted Combined Upper Subordinate Pre exam 2016 on 20 March 2016. The test was held at various centres in Uttar Pradesh. All question of Upper PCS Pre exam were objective type. Total 150 Questions have been asked for answering in 2 hours Time. Upper PCS pre exam carry 300 marks and time given was 2 hours. Those candidates who had appeared, can check UPPSC Upper Subordinate Exam result from the direct link given below. Through the result, candidates can know how much marks they can score in the written exam. Whether they can qualify the test or not. UPPSC had conducted Preliminary exam on 20 March 2016 for Upper Subordinate posts. Now Pre Result and Marksheet had been released. Candidates can check UPPSC Upper Subordinate result from the official website uppsc.up.nic.in via the direct link given below. 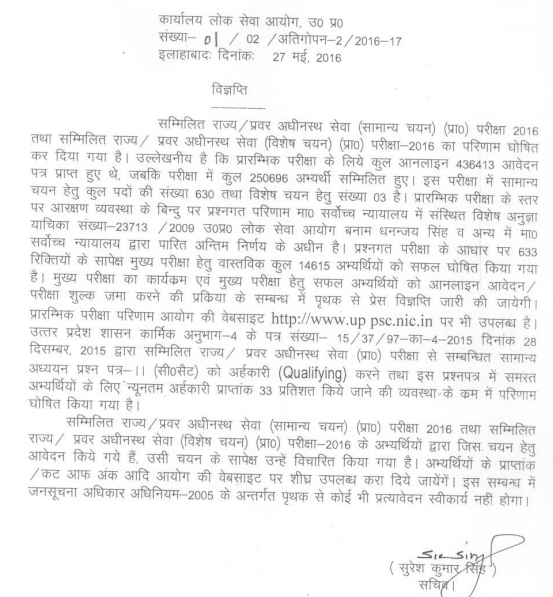 UPPSC had announced Upper PCS result on 27 May 2016. UPPSC had organized a Preliminary Examination for admission to the Combined Upper Subordinate Services Examination 2016. Those who qualify Pre & Main exam will be called for interview. After the declaration of Pre exam result, main exam will be held. Only such candidates will be called for interview who are declared successful on the basis of the main (written) examination. Candidates will have to fill up the prescribed application form before the Interview (viva-voce test). Preferences for different posts will be asked at the time of Interview which will be treated final and no change therein will be worthy of being admitted. On the basis of this examination, approximately eighteen times candidates shall qualify for the main examination and approximately upto three times candidates from the main examination shall be called for the interview. Here is the expected cut off of 2016. Main Examination will be held for Pre exam qualified candidates. candidates have to select any two subjects from the list of optional subjects for main examination. Each optional subject will consist of two papers. In order to check the result for UPPSC Upper Subordinate exam, candidates need to visit the direct link provided here. It will take you directly to result document. We had updated you via this page as soon as results got announced.